If you've flown into Frankfurt, a short drive to the Rhine River Valley will ease you into a trip to Germany. While the Rhine is hundreds of miles long, it is the short stretch between Koblenz and Bingen that you really want to see. This stretch is only 36 miles long (58 km). THAT's pretty do-able. Get a rental car and head straight to the river and its cute little towns. There are Rhine River Cruises. These have gotten really popular the last few years. You can take a two hour cruise from Bacharach to St. Goar and see the most scenic part of the river. It's fun to see the Rhineland Castles from the river, but to really explore, we prefer driving the narrow roads on both sides of the river. There are, surprisingly, lots of castles to see in this short stretch of river. 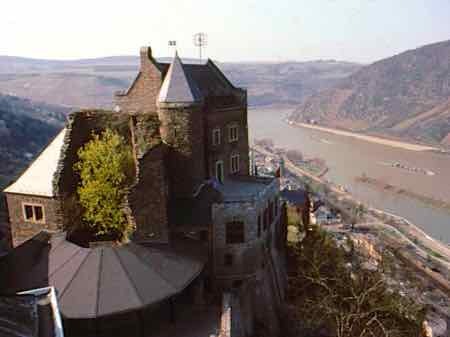 The castles of the Rhine started out as fortresses to protect the land owners or to collect tolls from river traffic. Many of the old castles were spruced up in a romantic way. What you see today is a combination of restored castles and crumbling castle ruins. You can tour some and stay in others. The scenery here is beautiful and peaceful. There are hills climbing up from the river topped with vineyards as well as castles. Spend time in the little towns the castles protected and watch barges and river cruises pass up and down the Rhine River. Ferries will let you get from one side of the river to the other. Roads on both sides of the river have excellent views as well as charming towns and restaurants with terraces that overlook the Rhine and the boat traffic. The most popular towns are Bacharach and St. Goar. 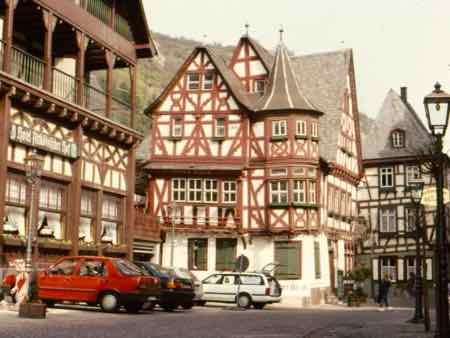 Bacharach is a great place to find hotels and B&Bs. It also has some of the best wine in the region. The Loreley is a very narrow spot in the river... so narrow and with a swift current that it proved very treacherous to boats. Soon, sailors were blaming the problems and wrecks on mermaids, and a legend was born. The sailors said mermaids sat on the rock. 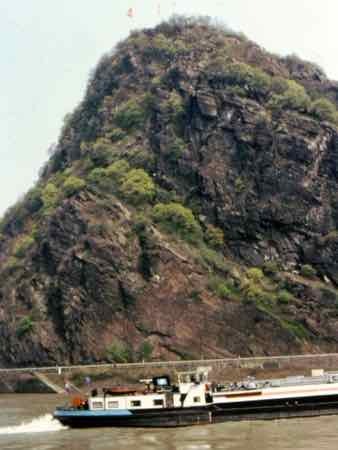 The town of St. Goar is near this rock. It sprang up as a place that sailors could stop and give thanks for getting past the Loreley. There are the ruins of Rheinfels Castle above town. It was once the mightiest castle on the Rhine River. See Katz and Maus castles. Katz Castle (Burg Katz, Katz means cat) was owned by a family named Katzenelnbogen. Maus Castle (Burg Maus... mouse... get it?) got named because it was near Katz Castle. 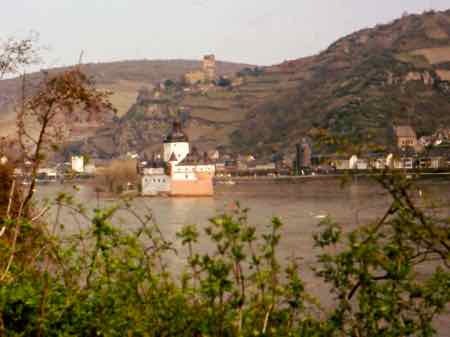 Pfalz Castle, shaped something like a ship, is in the middle of the river. That's it in the photo at the top. It was built to collect tolls from boats passing on the river. Gutenfels Castle sits on the bank above it. A Castle that you really should tour is the Marksburg Castle. The tours are mostly in German, but it is the only surviving medieval castle on the Rhine. It's one of those romantic reconstructions, but who said romantic was bad? Or..... how about a night in the Hotel Bur Reichenstein or Castle Liebenstein. Take a day or two in this beautiful part of the Rhine River Valley.... EVen though it's a short stretch of river, there is lots to see and do. Stay in a castle, or just tour one. Have a little wine and enjoy your trip.